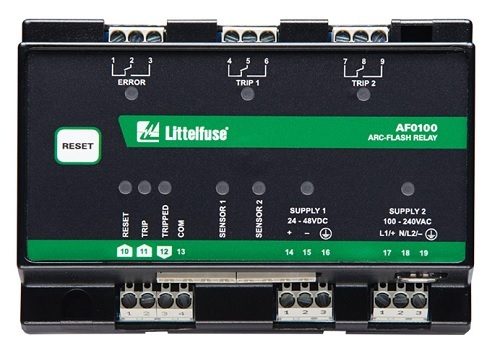 The AF0100 Series arc-flash relay is a cost-effective solution that reduces arc-fault damage by detecting the light from an arc flash and rapidly tripping. Two remote light sensors can be connected to one relay and multiple AF0100 and/or AF0500 relays can be connected to monitor additional sensors, providing complete coverage for a wide range of applications. The compact, DIN-rail or surface-mountable body makes this an ideal solution for equipment manufacturers. Two isolated Form-C contacts are provided for applications with multiple devices that must be tripped. This is especially useful for generator applications where the generator and breaker need to be tripped in case of an arc flash. The AF0100 accepts PGA-LS10 point sensors and PGA-LS20/ PGA-LS30 fiber-optic sensors in any combination. Sensor health is continuously monitored to ensure fail-safe operation. A solid-state redundant trip circuit provides an internal fail-safe mechanism and fast arc-flash response during power up. Front-panel and sensor LEDs indicate sensor health and fault location.